This NY Times story disappeared pretty fast from the top of the page, online addition. I couldn’t find it at all with a pretty close scan at 6:30 EST. I probably just am missing it. I had just come here after seeing the headline and header of the story. The article behind the paywall. Now it’s gone or buried. It may have been a top story most of the day so its shelf life expired. Old wine, new bottles. Wonder who leaked those letters from Trump’s lawyers? Mueller’s team has been as watertight as an Amsterdam canal. Many thanks for all that work. Schmidt and Haberman continue to amaze. Neither is credulous, but their writing suggests they think their readers are impossibly so. Their pieces are so well-timed with the Trump regime’s Sunday outreach, it almost looks like a coordinated effort. It’s as if the Times is taunting Mueller for not leaking. We’ll make the best story we can out of whatever is available, they seem to say. If that’s all from Trump, that’s all we’ll cover. Charming idea, except it ignores that the Times is committed to access journalism, which means it tells the story from the perspective of the side that gives them access. 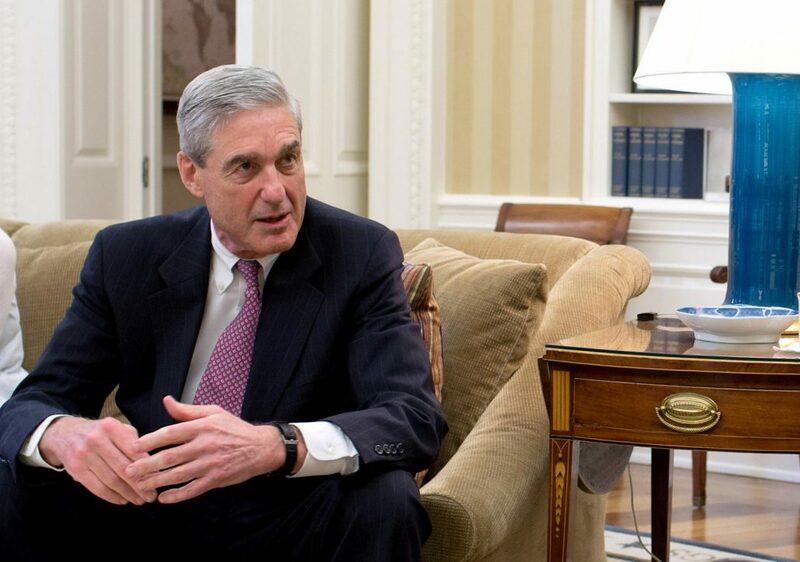 The idea that any lawyer would recommend Trump have a voluntary sit-down with Bob Mueller is laughable. It doesn’t matter what information Mueller might disclose. He won’t sit for an interview unless subpoenaed, and he would fight that to the Supremes. The information might help Trump, but it won’t change his mind about not talking with Mueller. Trump and Rudy are working hard to make the irascible, changeable, stubborn Trump look reasonable. That’s quite a magic trick. I guess my problem is they trust the judgment of Trump’s lawyers, which is clearly wishful thinking. It’s abundently clear that everyone around Trump knows that there is no way for him to speak to Mueller without perjuring/incriminating himself. This is remarkable to say about a US president but this is the depth to which we’ve sunk. They keep using the word trap as if anyone speaking to the FBI is inevitably trapped, and they’ve leaned into this to discredit the Flynn flip. As an attorney, I can tell you that no attorney would counsel a client to plead if a statement can be readily explained away. Furthermore, clients can generally make limited corrections to transcripts to clear up mistakes and understandable errors, though that can be brought up at trial. This delay to discredit tactic is about as clear an admission of guilt as can be had without an actual plea from Trump. Note that Kavanaugh has argued against presidential investigations. 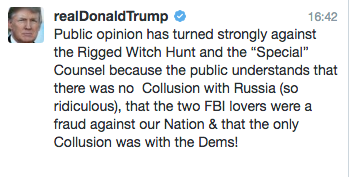 Surely the president’s lawyers are aware that Clinton was impeached for perjury and obstruction was alleged against Nixon but he was never impeached for it. NY Mag had a worthy overview of l’affaire Russe today. Yes, “Old wine, new bottles,” when what we need is to put some new wine in their old wineskins. Good column from the WaPo’s Margaret Sullivan about Marcy’s revelation that she felt compelled to report a source to the FBI. Favorably covers the conflicting issues, and that only Marcy could know if her decision was correct. It respects her choice. Everyone suffers from incomplete information when making hard decisions. From Marcy’s perspective, she revealed a source that was lying to her, compromised her work and her website, and threatened to compromise the interests of the United States. Unlike Mr. Trump, she made the correct call, consistent with her responsibilities as a journalist. Katrina vanden Heuvel, heiress, publisher of the Nation, and establishment member of the Council on Foreign Relations, thinks we need to know more and have a broader debate. A good idea. Imagine if the same judgment Marcy used applied to access journalists. Maggie H. might have to look for another line of work. I have a small bone to pick, however, with the way Sullivan’s piece is being marketed. The teaser is that Marcy broke a cardinal rule of journalism – protect a source – here’s why…. My problem is this. If Marcy reasonably believed her source was doing what she understood it to be doing, she did Not break a cardinal rule of journalism or citizenship. She applied it correctly. I went down the rabbit hole and read the comments. Wish I hadn’t. I think it would have been worthwhile for Sullivan to point out that The Post prominently revealed a source in the past year — the James O’Keefe flunky who tried to peddle fake Roy Moore info. I think the context would have strengthened the point that a promise of anonymity isn’t absolute, and there are times when that promise needs to be reconsidered. And quite frankly, I think the press is overdue for another round of questioning, especially the NY Times. There’s a difference between outing a source and reporting one to the FBI. Virtually all the interesting stuff I knew abt this person (as much from observation as what he told me) is protected by no confidentiality agreement. The “off the record” text was a rarity for us, and I didn’t agree to it (as is clear). But simply reporting it out wasn’t a good option at the time. Yeah, I agree the Post’s James O’Keefe outing was a different beast. I just feel that when Sullivan begins her piece “It’s pretty much an inviolable rule of journalism: Protect your sources” that it’s helpful for her to bring up the Post’s recent history of turning on a source. I think the Post made the right call, even though the reasons were different. But they did make the call, it wasn’t a trivial matter, and I hope that it made at least a few people think twice before pushing lies to the media for malicious reasons. Wonder if the “source” has noticeably changed behaviour (one way or t’other) since seeing his words published on this site? I read all the comments in WaPo story too. Dismaying that some can’t see the wood for the trees. 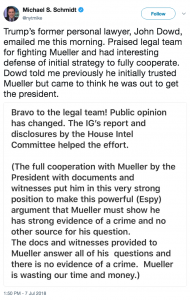 But this cheered me up (quote Benski): “Reporters rarely give up their sources to law enforcement,.. but then again, presidential campaigns never criminally conspire with a foreign nation to subvert an American election.” Please keep up the fantastic work MW. I would suspect this is the exception that makes the rule. Please keep up the fantastic work MW. I applaud what you did. Just read the article in the Post. Bravo! “I’m making this public now because a David Ignatius report Thursday maps out an imminent deal with Russia and Israel that sounds like what was described to me within hours of the election. This deal appears to be the culmination of an effort that those involved in the Russian attack worked to implement within hours after the election.” -from your post. Antagonizing our only two neighbors, Canada and Mexico. Antagonizing our oldest and closest allies in Europe. Starting trade wars with anyone and everyone. disregard and disrespect for laws and norms in democratic regimes, including his own. Bullying his opponents and detractors. This is only a partial list, of course, but I wonder: if, in 2016, one wished to isolate the US and drive a wedge between it and it’s allies, could one have hoped for a better outcome? Who else conspired besides Russia? The Schmidt tweet. Check the replies. Why don’t you simply post it instead of asking readers to engage in a goose chase? The ‘one’ is not a reply, but a person. I have seen zero evidence that Mueller has had any conversations with *any* trump lawyers (former or current). Anyone? The Schmidt assertion is made from whole cloth. It is wishful thinking. Sure. 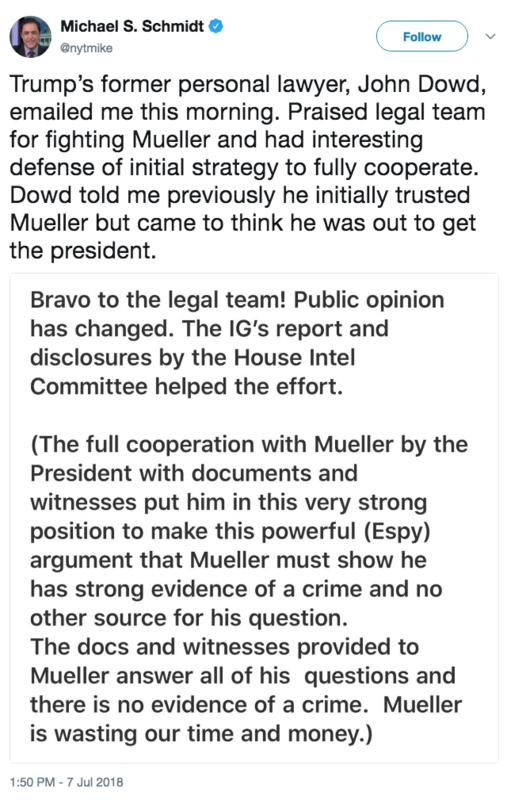 There is abundant evidence that Cobb, Dowd and Sekulow met and/or talked to the Mueller shop many times. There is no reason to believe regular communication, of some kind, is not happening. brett kavanaugh served with ken starr on starr’s independent counsel investigating any and all aspects of bill clinton’s public life that could remotely be justified. kavanaugh had the distinction of investigating whether the clintons’ had had vincent foster killed. how much more partisan and stupid can you get? i’d guess kavanaugh is trump’s trump card on the supreme court to protect the president from any office of special counsel’s negative decisions. chiej justice roberts will let him write the decisions should that prove necessary. it looks like abortion was not on trump’s mind when he appointed kavanaugh. i’m guessing that was territory earlier assigned to neil gorsuch’s whose appointment was trump’ s payback to the rightwing christians. american conservative catholic leaders are hard, cold religious ideologues. they have led the attack on pope francis, the only world leader we have and, amazingly for such a leader, one who speaks sensibly about the environment, about poverty, and about human sexuality. their political acolytes have no business being on an american supreme court in such numbers. leonard leo is the highly conservative head of the federalist society which takes credit for placing several such misfits on the supreme court. i have observed individuals operating solo with what were clearly good motives almost consumed by hives of corrupt individuals whose corruption that individual was exposing with the expectation there would be receptivity among leaders not involved in the corruption.